WATCH HER RUN 'We must continue to work for social, economic, educational and environmental justice,' says Mariko Yamada. Mariko Yamada was termed-out of her Napa Assembly seat in 2014 and returns to politics this year running for State Senate in the Third District, which comprises all of Napa County and parts of Sonoma County. The longtime social worker will face off against Bill Dodd in the California state Democratic primary on June 7; Dodd was interviewed in this space two weeks ago. As with Dodd, the full interview is up on the Fishing Report blog at Bohemian.com. 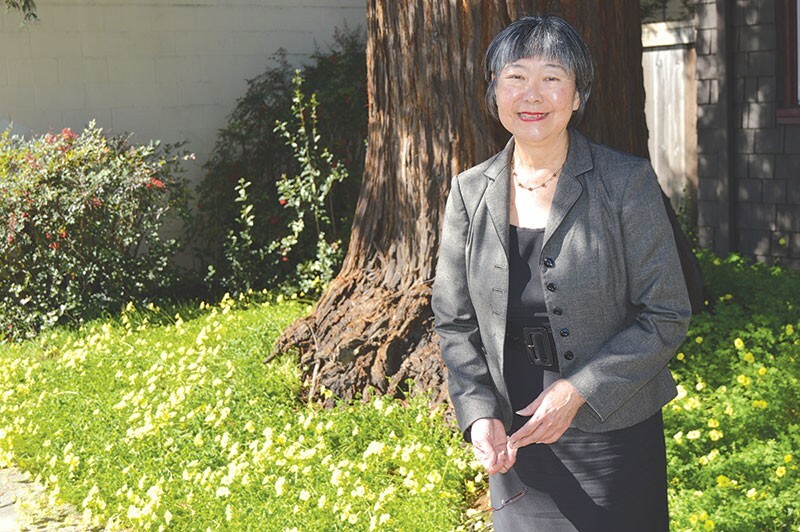 Yamada, who speaks proudly of her 42 years of public service, lives in Yolo County and is the child of Japanese-American parents who were interned during WWII. I met with Yamada last week at the Bohemian's office and asked her many of the same questions I put to Dodd, the first of which was whether or not Napa and the North Bay in general had reached a point of "peak wine," where there's just no more space for another vineyard. Mariko Yamada: Yolo County, which is where I live and have lived for 22 years, was one of my first experiences immersing myself in rural and agricultural issues. I was pretty much a city kid all my life, and I consider the last 22 years of my 42 years in public service really important, a change of direction, because that's part of the issue: what's the understanding of the rural and urban issues as they relate to wine and the wine industry, which of course is a key part of our agricultural district and heritage? There are significant debates going on right now about land use as it relates to water and the sustainability issues—not just related to wine issues, but all agriculture. The questions are being asked: are we the victims of our own success? You posed the question of just how much more can be done, and I think the issues of climate change and water resources and land resources are going to be self-defining—is there a tipping point over which we can't go? Bohemian: What's your view of the Fight for $15 minimum-wage push? Yamada: There are two tenets that I think of. Nothing is getting any cheaper, and none of us is getting any younger. . . . I support an increase in the minimum wage. It has to be in a partnership at the federal level, which doesn't look too hopeful anytime soon, but there should be a federal commitment to it. But we can't wait for other levels of government to lead the way. I do support an increase to $15 over a period of time, but I also support a need for small business—there's got to be something in it for them, and I'd point to the costs of healthcare and the costs of workers' compensation which are crushing middle class families . . .
Bohemian: Who would you describe as the main base of support for your Senate run? Yamada: I want to make sure that people don't try to typecast anybody in the race, because while I have a track record of 42 years of public service, I think our support comes from a pretty diverse group of people. Certainly, I'm a lifelong Democrat, unlike my principal opponent who recently became a Democrat, just around the time, I think, that he was deciding to possibly run for the Assembly. . . .
My support has traditionally come from what I would call "everyday people." You need only look at our finance reports to tell. I think Mr. Dodd has, maybe, a little over 400 donors or donations, but he's managed to raise about a million dollars. And we have more than twice that number of donations, but we've raised a quarter of a million dollars. We have over 800 donations. . . . I have both Democratic and Republican support, I have Green support, and I have support from independents. I think we appeal most to what I would call a pragmatic approach to solving some of our state's most difficult problems. Bohemian: Given the limits of the Affordable Care Act related to providing healthcare to the undocumented, and the heated rhetoric around immigration, what more can the state do to help the undocumented? Yamada: If you look at this in a historical context, our country was really built on taking advantage of labor. . . . This is not a new phenomenon in our country. We've had varying levels of success partly due to the rise of the labor movement and other activists that pointed out the problems in how our capitalist system, frankly, operates. . . . We've taken incremental steps to bring people out of the shadows, given that we don't have a partnership with the federal government, which is exactly where comprehensive reform resides. We are going to have to continue to make these incremental steps towards ensuring that people who have come here, live here, work here, really pay taxes in their own way but don't get certain benefits out of it. . . . As it relates to a general contractor and his or her ability to meet a bottom line, I would hope that the business community would join us and make a business case for immigration reform. It shouldn't be either/or, because both sides are benefiting from each other's existence.